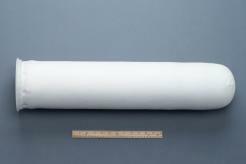 BOS microfiber with pre-filter cartridge insert. BOS MAX are heavy duty seamless filter bags with advanced design that provides extended life and increased efficiency with a greater depth filtration than conventional filter bags. These filter bags have a durable multifilament mesh cover that provides structural support and abrasion resistance, and facilitates installation and removal from the filter housing.